Ainu language(s) (/ˈaɪnuː/; Ainu: アイヌ・イタㇰ Aynu=itak; Japanese: アイヌ語 Ainu-go) are a small language family (or a language isolate) originally spoken on the northern Japanese island of Hokkaidō, the southern half of the island of Sakhalin, the Kuril Islands, and the southern tip of the Kamchatka Peninsula. It is often supposed that Ainu was the language, or at least one of the languages, of the indigenous Emishi people of the northern part of the main Japanese island of Honshu, a supposition supported by placenames that appear to be of Ainu origin (see Ainu language). The varieties of Ainu are alternately considered a group of closely related languages, or divergent dialects of a single language isolate. The only surviving member is the Hokkaidō Ainu, which is considered critically endangered by UNESCO. No genealogical relationship between Ainu and any other language family has been demonstrated, despite numerous attempts. Shibatani (1990:9) and Piłsudski (1998:2) speak of "Ainu languages" when comparing the varieties of Hokkaidō and Sakhalin. However, Vovin (1993) speaks only of "dialects". Refsing (1986) says Hokkaidō and Sakhalin Ainu were not mutually intelligible. Hattori (1964) considered Ainu data from 19 regions of Hokkaido and Sakhalin, and found the primary division to lie between the two islands. Data on Kuril Ainu is scarce, but it is thought to have been as divergent as Sakhalin and Hokkaidō. In Sakhalin Ainu, an eastern coastal dialect of Taraika (near modern Gastello (Poronaysk)) was quite divergent from the other localities. The Raychishka dialect, on the western coast near modern Uglegorsk, is the best documented, and has a dedicated grammatical description. Take Asai, the last speaker of Sakhalin Ainu, died in 1994. The Sakhalin Ainu dialects had long vowels and a final -h phoneme, which they pronounced as /x/. Hokkaidō Ainu clustered into several dialects with substantial differences between them: the 'neck' of the island (Oshima County, data from Oshamambe and Yakumo); the "Classical" Ainu of central Hokkaidō around Sapporo and the southern coast (Iburi and Hidaka counties, data from Horobetsu, Biratori, Nukkibetsu, and Niikappu; historical records from Ishikari County and Sapporo show that these were similar); Samani (on the southeastern cape in Hidaka, but perhaps closest to the northeastern dialect); the northeast (data from Obihiro, Kushiro, and Bihoro); the north-central dialect (Kamikawa County, data from Asahikawa and Nayoro); and Sōya (on the northwestern cape), which was closest of all Hokkaidō varieties to Sakhalin Ainu. Most texts and grammatical descriptions we have of Ainu cover the Central Hokkaidō dialect. Scanty data from Western voyages at the turn of the 19th–20th century (Tamura 2000) suggest there was also great diversity in northern Sakhalin, which was not sampled by Hattori. Vovin (1993) splits Ainu "dialects" as follows (Vovin 1993:157). No genealogical relationship between Ainu and any other language family has been demonstrated, despite numerous attempts. Thus, it is a language isolate. Ainu is sometimes grouped with the Paleosiberian languages, but this is only a geographic blanket term for several unrelated language families that were present in Siberia before the advances of Turkic and Tungusic languages there. Another suggestion is that Nihali and Kusunda are remnants of a northern division, that once extended to Japan. The most frequent proposals for relatives of Ainu are given below. Alexander Vovin (2016) notes that Ainu has had early contact with the unrelated Nivkh language, and that this contact had most likely happened on Hokkaido island. Today, Nivkh is spoken only on Sakhalin island and at the mouth of the Amur River. Ainu of Sakhalin has more recent influence from Nivkh that Ainu of Hokkaido does not have. John C. Street (1962) proposed linking Ainu, Korean, and Japanese in one family and Turkic, Mongolic, and Tungusic in another, with the two families linked in a common "North Asiatic" family. Street's grouping was an extension of the Altaic hypothesis, which at the time linked Turkic, Mongolic, and Tungusic, sometimes adding Korean; today Altaic sometimes includes Korean and rarely Japanese but not Ainu (Georg et al. 1999). From a perspective more centered on Ainu, James Patrie (1982) adopted the same grouping, namely Ainu–Korean–Japanese and Turkic–Mongolic–Tungusic, with these two families linked in a common family, as in Street's "North Asiatic". Joseph Greenberg (2000–2002) likewise classified Ainu with Korean and Japanese. He regarded "Korean–Japanese-Ainu" as forming a branch of his proposed Eurasiatic language family. Greenberg did not hold Korean–Japanese–Ainu to have an especially close relationship with Turkic–Mongolic–Tungusic within this family. The theory is now seen as discredited. Shafer (1965) presented evidence suggesting a distant connection with the Austroasiatic languages, which include many of the indigenous languages of Southeast Asia. Vovin (1992) presented his reconstruction of Proto-Ainu with evidence, in the form of proposed sound changes and cognates, of a relationship with Austroasiatic. In Vovin (1993), he still regarded this hypothesis as preliminary. The eminent Japanese linguist Shichirō Murayama tried to link Japanese to the Austronesian languages, which include the languages of the Philippines, Taiwan, and Indonesia, through both vocabulary and cultural comparisons. Numerous linguists have argued for a relationship between Ainu and several Native American languages. A linguistic research in the year 2008 proposed a genetic relation of Ainu to Native American languages. In 2018, the linguist Anna Bugaeva, an associate professor of linguistics at the Tokyo University of Science, and one of the few specialists in the Ainu language, says that the grammar system, phonological elements and syntax of the Ainu language is closest to languages of Native Americans on the western coast of North America. She claims that Ainu is closest to the Athabaskan languages. Ainu also shows some similarities to the Ket language, which has been linked to the Athabaskan languages in the proposed Dené-Yeniseian macrofamily classification. ^ a b Hammarström, Harald; Forkel, Robert; Haspelmath, Martin, eds. (2017). "Ainu". Glottolog 3.0. Jena, Germany: Max Planck Institute for the Science of Human History. ^ Vovin, Alexander. 2016. "On the Linguistic Prehistory of Hokkaidō." In Crosslinguistics and linguistic crossings in Northeast Asia: papers on the languages of Sakhalin and adjacent regions (Studia Orientalia 117). ^ Shichirō, Murayama (1976). "The Malayo-Polynesian component in the Japanese language". Journal of Japanese Studies. 2 (2): 413–436. doi:10.2307/132060. JSTOR 132060. ^ Gerhard Jäger, "Support for linguistic macrofamilies from weighted sequence alignment." PNAS vol. 112 no. 41, 12752–12757, doi: 10.1073/pnas.1500331112. Published online before print September 24, 2015. ^ "Anna Bugaeva: Endangered Ainu language is treasure trove for linguists". The Asahi Shimbun. Retrieved 2018-12-25. Bronisław Piłsudski (1998). Alfred F. Majewicz (ed.). The Aborigines of Sakhalin. The Collected Works of Bronisław Piłsudski. I. Berlin-New York: Walter de Gruyter. p. 792. ISBN 978-3-11-010928-3. Murasaki, Kyōko (1977). 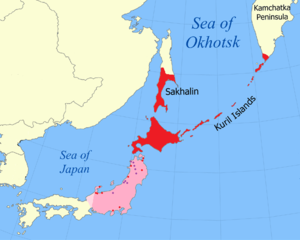 Karafuto Ainugo: Sakhalin Rayciska Ainu Dialect—Texts and Glossary. Tokyo: Kokushokankōkai. Murasaki, Kyōko (1978). Karafuto Ainugo: Sakhalin Rayciska Ainu Dialect—Grammar. Tokyo: Kokushokankōkai. Vovin, Alexander (1992). "The origins of the Ainu language" (PDF). The Third International Symposium on Language and Linguistics: 672–686. Vovin, Alexander (1993). A Reconstruction of Proto-Ainu. Leiden: Brill. ISBN 978-90-04-09905-0. Bengtson, John D. (2006). "A multilateral look at Greater Austric". Mother Tongue. 11: 219–258. Georg, Stefan; Michalove, Peter A.; Ramer, Alexis Manaster; Sidwell, Paul J. (1999). "Telling general linguists about Altaic". Journal of Linguistics. 35: 65–98. doi:10.1017/s0022226798007312. Greenberg, Joseph H. (2000–2002). Indo-European and Its Closest Relatives. Stanford: Stanford University Press. ISBN 978-0-8047-3812-5. Patrie, James (1982). The Genetic Relationship of the Ainu Language. Honolulu: The University Press of Hawaii. ISBN 978-0-8248-0724-5. Shafer, R. (1965). "Studies in Austroasian II". Studia Orientalia. 30 (5). Street, John C. (1962). "Review of N. Poppe, Vergleichende Grammatik der altaischen Sprachen, Teil I (1960)". Language. 38 (1): 92–98. doi:10.2307/411195. JSTOR 411195.